I've currently posted Chapter Two of Crimson Insignia and so far, I've had one review for Chapter One from CherryKay. I appreciate her full honesty for the first review as she stated that my female character Kago Miharu was leaning a little too close to a Mary Sue. However, I think it's still too early to tell because I've only posted the Prologue and the First Chapter. I'm looking forward to hear her thoughts on Chapter Two though. Constructive criticisms have always been welcomed and I'm glad that she chose to look out for Crimson Insignia. 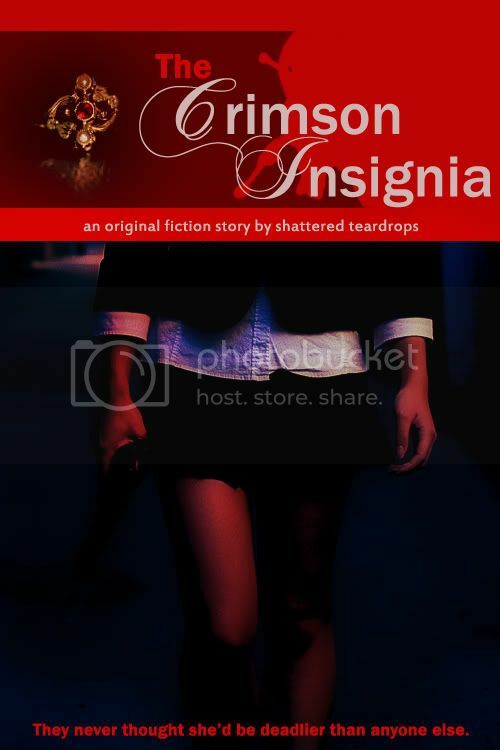 Also, I'm glad to announce that I will be releasing the Poster & Teaser of Crimson Insignia to the public now. The poster looks more like a book cover than a poster but I am thinking of making another poster which would look like a movie poster and see what the readers would think. So, how do you guys like it? Again, credits to doctor.brew from Flickr for the image of "Angela" holding a gun. They're really an awesome and talented pair. doctor.brew also has other images of women which are really nice pieces. It's a little hard to believe that he's only an amateur photographer because he takes such nice pics.